(6 photos of a 1965 Emberglo Mustang Hardtop) Emberglo 1965 Mustang hardtop with white rocker stripes. This car was just recently restored. with a 1966 Mustang paint color. (1 photo of a 1966 Emberglo Orange Mustang Hardtop) 1966 Emberglo orange Mustang hardtop with full wheel covers and metal rocker panel molding. (12 photos of a 1966 Emberglo Orange Mustang GT Fastback) This Emberglo 1966 Mustang GT fastback with K-code engine was the Attitude Of The Week for 9/16/2007. The GT package was very popular in 1966 because the option sold for $152.20 and included the high-performance 271hp (at 6000rpm), 289 cubic inch, V8 engine; dual exhaust; fog lamps; special ornamentation; disc brakes; GT racing stripes and handling package components. This Mustang shows off its Red Band nylon tires which was a option for $48.89, and styled steel wheels for $93.84. This photo is available in two wallpaper sizes; 800-600 wallpaper and 1024-768 wallpaper. (4 photos of a 1966 Emberglo Orange Mustang Hardtop) Emberglo 1966 Mustang hardtop owned by Cav C from Louisiana. This Mustang was born Emberglo. Under the hood is the original 289 V8 engine. It also has a manual transmission. Cav purchased it in 2010. Modifications include; MB Old School 17x8 wheels, 225/45 front tires 235/45 rear tires, KYB shocks all around, 1-inch Drake Scott front sway bar, Holley 4-barrel 650 cfm Street Avenger carb, and dual Cherry Bomb 18-inch glass packs. Cav also owns a Ingot Silver 2011 Mustang. (10 photos of a 1966 Emberglo Orange Mustang Sprint Convertible) Emberglo 1966 Mustang Sprint 200 convertible with a 120hp (at 4400rpm), 200 cubic inch, 1 barrel, inline 6 cylinder engine. Promoted as the Millionth Mustang Success Sale, the Sprint 200 limited edition package was offered mid 1966 when Ford worried about inventory problems with the first V8 level upgrade 289ci engine. The Sprint 200 was a sport package specifically designed for the base 200ci 6 cylinder engine which were plentiful. Other Sprint options included center floor console; painted side accent stripes (color matched with the car's interior); deletion of the chrome rear quarter ornaments; and a set of deluxe 48 spoke, blue center wire-style wheel covers. (13 photos of a 1966 Emberglo Orange Mustang Hardtop) Emberglo 1966 Mustang hardtop with a black vinyl roof, full wheel covers, metal rocker panel moldings, and a 120hp (at 4400rpm), 200 cubic inch, 1 barrel, inline 6 cylinder engine. (7 photos of a 1966 Emberglo Orange Mustang Sprint Hardtop) Emberglo Orange 1966 Mustang Sprint 200 white vinyl hardtop, wire wheel covers, metal rocker panel trim, side c-stripe, and a 120hp (at 4400rpm), 200 cubic inch, 1 barrel, in-line 6 cylinder engine. The 1996 Sprint upgrade package was Ford's answer to the projected dwindling supply of the 289ci V8 engine by enticing customers to buy a sportier Mustang with the base 6 cylinder engine. Advertised as a "Limited Edition" the campaign worked and survived for the next few years. (11 photos of a 1966 Emberglo Orange Mustang GT Convertible) Emberglo 1966 Mustang GT convertible with steel styled wheels, white GT side stripe, emberglo and parchment pony interior, fog lamps, and a 200hp (at 4400rpm), 289 cubic inch, 2 barrel, V8 engine. (10 photos of a 1966 Emberglo Orange Mustang GT Hardtop) Emberglo 1966 Mustang GT hardtop with steel styled wheels, rocker panel stripe, fog lamps, GT fender emblem, and a 289ci V8 engine. (5 photos of a 1966 Emberglo Orange Mustang GT Hardtop) Emberglo 1966 Mustang hardtop owned by Joe Parker from Charlotte, North Carolina. It has its original 289ci V8 engine and an automatic transmission. Joe tells us more, "My Father bought the Mustang for my Mother's Christmas present in 1965. It was Emberglo red with a black interior. Mom gave the car to me in 1971. I drove it for years until I left it in Texas to get restored when I moved back to North Carolina in 1990. The shop removed the engine and painted the engine compartment then let it sit for seven years and did not do any more work so I had it brought back to NC and left it with a restorer in Waxhaw NC till 2013. I kept in touch with him and he kept telling me he would do the work but it never got done. My Mom really didn't believe I would ever get it finished. When we picked it up to take it to the third restorer (Barry Stone); we found it in a lot behind the shop with the windows cracked open and many missing parts. We took it to get the body work done and it took three people 734 hours to complete the work. The engine and transmission were sent out to rebuilders. Then Barry went to work putting it all back together. He finished in August this year (2015). Sadly, Mom died in July and did not get to see it finished, but she did get to see over 100 pictures documenting the progress. It ended up costing over $52,000 for the restoration. The engine is no longer stock (aluminum heads, new cam, new intake and carburetor), I had the interior color changed and had a Cobra hood to replace the stock hood. I also had the suspension beefed up. I love the results and plan to drive it for many more years." (14 photos of a 1966 Emberglo Orange Mustang GT Fastback) Emberglo orange/brown/copper 1966 Mustang GT fastback with GT fog lamps, white GT rocker panel stripe, steel styled wheels, pony interior, and a 289ci 4-barrel V8 engine. (4 photos of a 1966 Emberglo Orange Mustang Hardtop) Emberglo 1966 Mustang hardtop owned by Dale Smith from Adelaide, South Australia, Australia. This was our featured Attitude Of The Week for the week starting January 10, 2010. Dale tells us, "I bought it from Auto Investors in Dothan Alabama in 2008. I put about six thousand miles on it this year. I am really loving the thrill of owning and driving such a beautiful classic car." (2 photos of a 1966 Emberglo Orange Mustang GT Hardtop) Beautiful Emberglo orange 1966 Mustang GT hardtop with steel styled wheels, white GT rocker panel stripes, and fog lamps. This is how Emberglo looks best, in the sun! (6 photos of a 1966 Emberglo Orange Mustang GT Convertible) An Emberglo orange 1966 Mustang GT convertible at the 2010 MCA Grand Nationals car show in Bellevue, Washington. This one has steel styled wheels, GT rocker panel white stripe, GT fender emblem, fog lamps, and emberglo pony interior. (7 photos of a 1966 Emberglo Orange Mustang GT Convertible) Check out this Emberglo 1966 Mustang GT convertible! This car was ordered with everything - big K-code engine, full GT package, and Pony interior. This car was a highlight of the 29th Annual Central Illinois Ford Day Show and Swap on June 6, 2010 in Bloomington, Illinois. (6 photos of a 1966 Emberglo Orange Mustang Convertible) This Emberglo orange 1966 Mustang convertible was at the 2010 Mustang roundup in the Tampa, Florida sun. It has steel styled wheels, Emberglo and white pony interior, and a nice V8 engine under the hood. 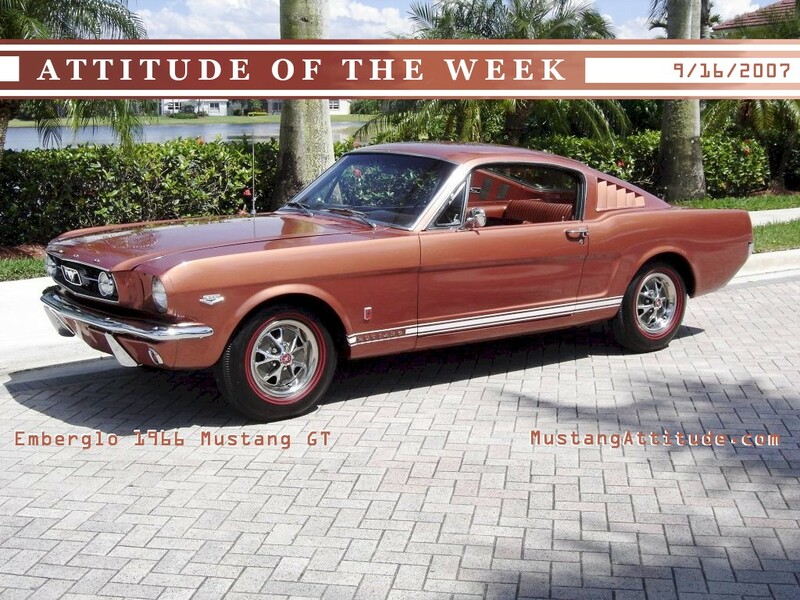 (5 photos of a 1966 Emberglo Mustang Hardtop) This amazing Emberglo orange 1966 Mustang hardtop with steel styled wheels is our Attitude Of The Week for the week starting June 16th, 2013. Besides the steel styled wheels, this car has a parchment pony interior, and a 289 V8 under the hood. I photographed this car last year at the Mustang Round up car show in the Seattle area.